Thanks to Warren Bolton, of The State newspaper, who wrote an editorial in support of moving the Seaco plant out of the Rosewood neighborhood. Mr. Bolton grew up in the Edisto Court community. We’re hopeful that the city will help the neighborhood reach a compromise with Associated Asphalt. Thanks to everyone who attended the DHEC public meeting on Tuesday. While it seems more questions were raised than answered, this meeting was a constructive step forward toward addressing the existing pollution and finding a solution that removes polluters from our neighborhood. We agree with Mayor Steve Benjamin’s assessment at the meeting that the best solution here is one that removes the Seaco plant from our neighborhood. RCC also strongly supports the Mayor’s land swap proposal to relocate Seaco from Rosewood to another, sparsely-populated location in the county. Please contact Mayor Benjamin and Councilman Moe Baddourah and let them know you support Mayor Benjamin’s land swap proposal. Read comments offered at the meeting by RCC here. At the meeting, Associated Asphalt presented their plans for expansion, to include building a railroad spur on newly-acquired non-adjacent property and instituting a scrubbing technology to help alleviate smells from the plant. We learned that Associated Asphalt is owned by Goldman Sachs. We also learned that hydrochloric acid, a dangerous substance that is a chemical component of asphalt emulsion, is stored in a 7,500 gallon tank on Seaco property. We have a long road ahead of us. RCC plans to remain involved with DHEC, EPA, and political leaders to ensure that the lead, arsenic, and any other pollutants are removed from our neighborhood and that responsible parties bear the cost of making our neighborhood safe for all of our residents. Find out more about the meeting from an article in The State, an article in The Columbia Star, and video coverage from WOLO. Last week, DHEC tested homes on Easy Street and Corning Road for lead and arsenic in the soil. DHEC delivered results to residents on July 30, 2012, and urged these residents to take precautions. If you were not notified of testing in your yard, then you are probably not at risk. The operations of a fertilizer plant that operated in the early 1900s is suspected to have caused this contamination. This map shows the location of the fertilizer plant superimposed over a 2012 map of the homes in the area. Here’s a map of this area in relation to the greater Rosewood neighborhood. Residents whose homes currently stand where this lake used to be may be at risk for contamination. DHEC has a website with more information about this lead and arsenic contamination. And you can read the latest news articles here and here. In early July, we learned that the Seaco asphalt emulsion plant was sold to new owners with plans to expand. During that sale, DHEC learned of groundwater contamination under the site. This is a different problem from the lead and arsenic in the soil. We don’t have full information on the groundwater contamination, but you can read more here. When: Tuesday, August 28, 2012, 6 p.m. Please join us to voice your opposition to the proposed expansion of the Seaco asphalt emulsion plant in the Rosewood neighborhood. We need strong neighborhood support to show DHEC that a neighborhood is not the right place for heavy industry that pollutes our groundwater and air! DHEC staff will give a short presentation on the findings of contamination on the property and then open the floor for public comments. Read more about the proposed expansion and the position of the Rosewood Community Council here. Also, please contact our elected leaders to voice your opposition. Find updated information below on the proposed expansion of the Seaco asphalt emulsion plant in the Rosewood neighborhood. A July 7 article in The State alerted the neighborhood to the sale and possible expansion of the Seaco asphalt emulsion plant. Rosewood Community Council wrote a letter to neighbors on July 10 about the expansion, with copies of the cleanup contract between DHEC and the new buyers, and RCC’s Freedom of Information Act requests. DHEC set up a website about the Seaco expansion. 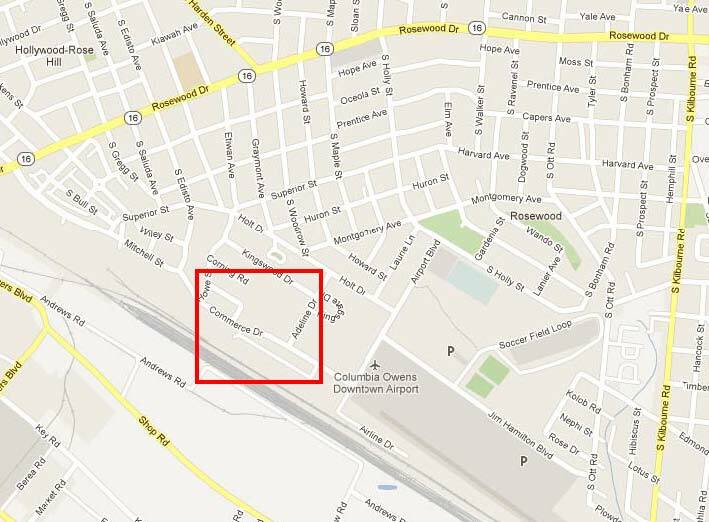 Lead and arsenic were found in the ground near Easy Street and Corning Road. Concerned residents met with city staff July 25. Mayor Benjamin wrote a letter to Seaco’s owners. 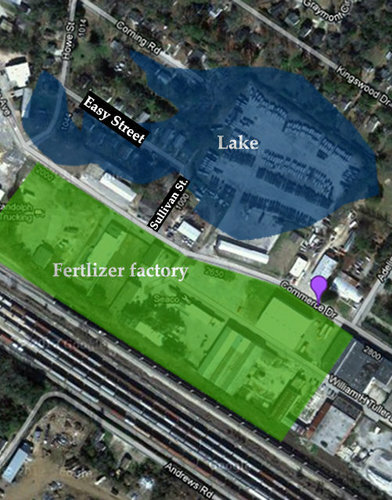 DHEC set up another website, this one about the fertilizer plant’s lead and arsenic contamination. DHEC presented Edisto Court residents with results of lead and arsenic soil testing on July 30, and urged neighbors to take precautions. The EPA began testing in the Edisto Court area on August 3. DHEC provided free arsenic and lead tests to residents of Easy and Howe Streets and Corning Road on August 6 and 7. The tests from DHEC showed no elevated levels or lead or arsenic. DHEC held a public meeting on Aug. 28. Read a news article about that meeting here and comments offered at the meeting by the Rosewood Community Council. The EPA announced it will clean up yards affected by soil contamination. DHEC officially entered into the Voluntary Cleanup Contracts with Associated Asphalt. DHEC published the comments submitted regarding the cleanup contracts. The EPA began cleaning up contaminated yards in October. EPA cleanup is expected to be completed by the end of the year. The EPA finished cleaning up contaminated yards in December and declared the area free of pollution. Find a compilation of news articles about the expansion here. Please contact Jenna Stephens at jenna@rosewoodcommunity.com if you have questions. Check back for updates. This page was last updated December 21, 2012. Columbia Mayor Steve Benjamin has sent letters to the past owner (and still-president) of Seaco, and to the new purchasers, Associated Asphalt, asking for a meeting with the city to discuss options to move the plant out of the neighborhood. The Rosewood Community Council appreciates the mayor standing with the neighborhood on this issue. Please let Mayor Benjamin know you appreciate his leadership: skbenjamin@columbiasc.net. Want to stay informed about what’s going on with the Seaco expansion, groundwater contamination, and lead and arsenic in the soil? Below is a running list of chronological news articles and videos we’ve compiled since we first learned about the proposed expansion. July 26, The State article about DHEC finding lead and arsenic in the soil near Easy St.
Rosewood is a 3000+ home neighborhood with 8 parks and 4 schools. It’s a neighborhood, not an industrial park. This expansion threatens the public’s health. Threats to public health demand an immediate response. This expansion threatens planned developments like the All Local Farmer’s Market relocation, Curtiss-Wright hangar renovation, and other local businesses that make the neighborhood a great place to live and work. Existing and future pollution threatens property values of our homes and discourages new residents. This pollution is only now being brought to the public’s attention. It is important that our elected leaders hear from us about this matter. Please spread the word. DHEC has a website dedicated to the proposed Seaco expansion and another site on the fertilizer plant believed to have caused the lead and arsenic in the soil. The Seaco site contains air and groundwater testing reports, the proposed contract between DHEC and the new owners of the property, and recent site assessments of the property . You can also sign up to be put on DHEC’s mailing list about this issue. As always, RCC will keep you informed of anything we know. If you haven’t already, please sign up for our newsletter. Read previous stories on the Seaco expansion here. Rosewood Community Council has hired an attorney to protect the interests of the neighborhood pertaining to the proposed expansion of the Seaco asphalt emulsion plant. Our attorney has submitted the comments below on behalf of the neighborhood. The firm has also issued a comprehensive Freedom of Information request to DHEC and has demanded that a public meeting be convened after we receive an adequate response to the FOI request. We will keep you informed of any updates. Please let me know if you have any questions or concerns. You can reach me at jenna@rosewoodcommunity.com.